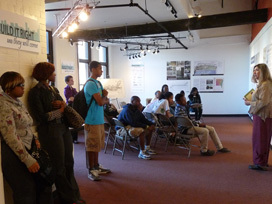 Joni Monroe teaches Urban League students the importance of good design. The Community Design Center of Rochester promotes healthy communities and quality of life by encouraging excellence in design of buildings and neighborhoods, as well as thoughtful use of existing resources. We help communities come together to create vision plans, and we provide technical assistance and training opportunities that promote the benefits of good design in urban planning. CDCR is pleased to serve the 9 counties of the Greater Rochester Area: Genesee, Livingston, Monroe, Ontario, Orleans, Seneca, Wayne, Wyoming, and Yates. We are design professionals, planners and citizens with a shared interest in implementing design excellence and sustainability in the greater Rochester area. See a list of our board members and staff members here. The Community Design Center was founded by members of the American Institute of Architects Rochester Urban Design Committee (AIAUDC), and was officially chartered in May 2003. It a 501 (c)(3) non-profit organization under the IRS code, and all contributions are tax-deductible. The Charter of the Congress for the New Urbanism and AIA 10 Principles for Livable Communities guide the work of the Design Center. A growing movement, New Urbanism recognizes walkable, human-scaled neighborhoods as the building blocks of sustainable communities and regions. These two documents define the essential qualities of urban places, from the scale of the region to the individual building.